There is no other joy than digging into an exotic fruit or sipping a thick creamy tropical smoothie ! Penang wet markets are always flooded with variety of tropical fruits . 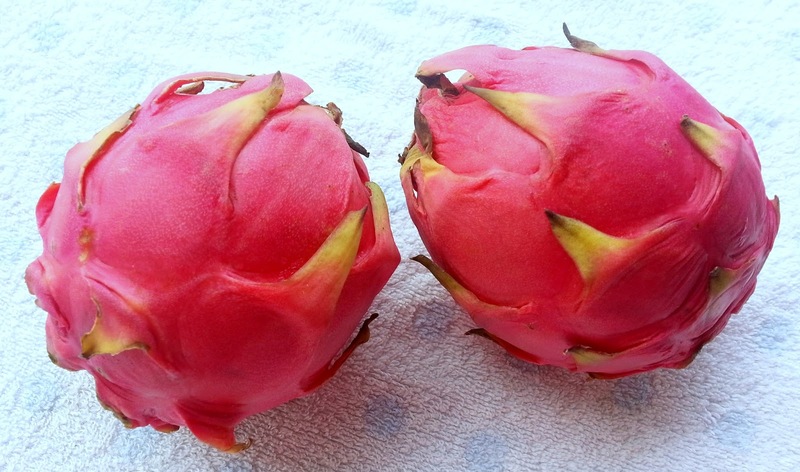 One such fruit, which I am literally in love with is the Dragon Fruit. It is also known as Pitaya. 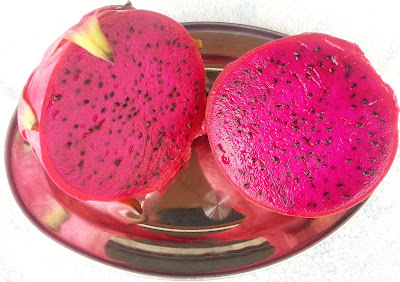 Unlike its name, the Dragon fruit is very beautiful with vibrant color and the flesh has a mildly sweet and delicate taste . It has countless number of edible black seeds embedded in its flesh. I love the red pitaya for its dark pink and sweet flesh . There is a variety which has white flesh and is less sweet than the red one. This fruit is to be cut into half and using a large spoon , the flesh is scooped out and cubed . It can be eaten as it is or blended into refreshing and colourful smoothie. If you are looking at some more recipes with Dragon fruit , check out my Dragon fruit jelly recipe. A smoothie is a thick beverage made from blended raw fruit or vegetable often with other dairy products, water , Ice and sweeteners. Smoothies are considered more healthier option than fruit juices alone as they include dietary fibre (pulp, often skin and seeds). 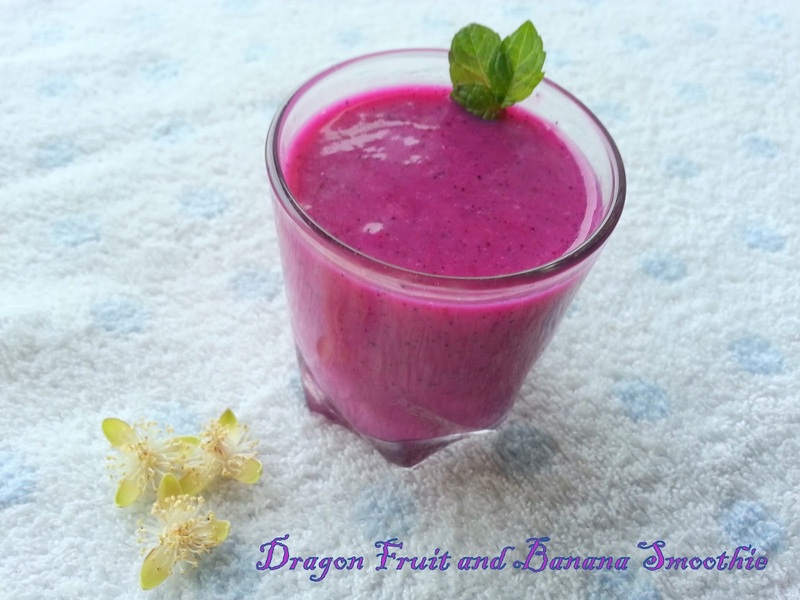 Here I have made a simple , refreshing and colourful smoothie using two tropical fruits - Dragon fruit and Banana. 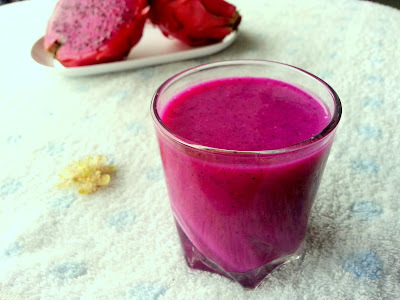 A filling , delicious and healthy drink , can serve as an excellent breakfast and a post workout / swimming energy booster . 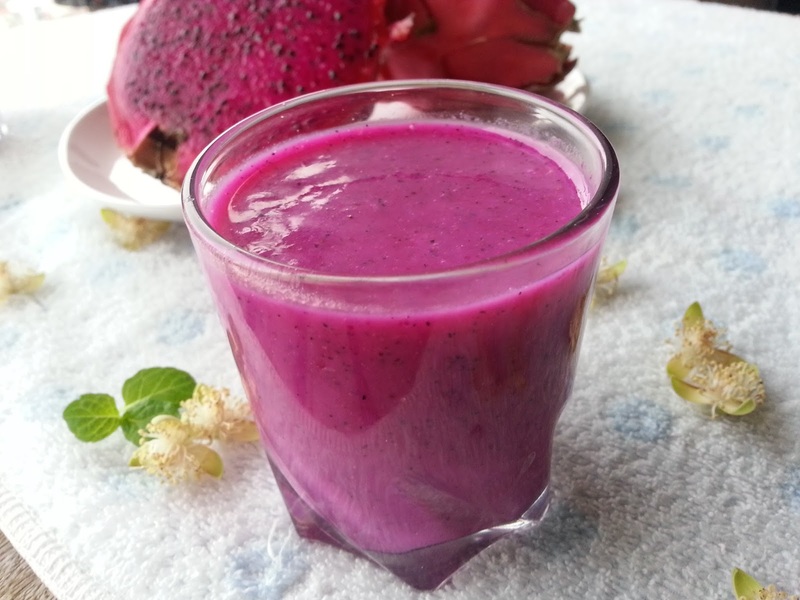 This Dragon fruit Banana Smoothie is not only a visual treat but also is very nutritious. 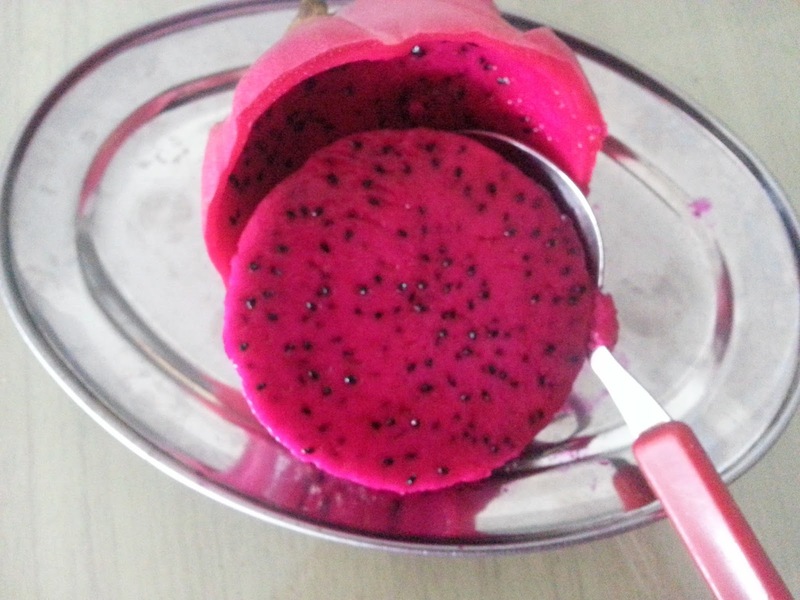 Dragon fruit is considered to be a wonder fruit , it is filling and delicious at the same time keeps check on weight. It has no complex carbohydrates so can be easily broken down by our body. The fruit has no cholesterol is rich in vitamin C and high in fibre. 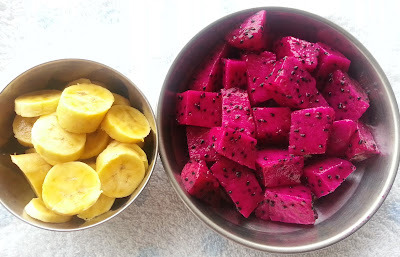 Dragon fruits are also packed with minerals such as calcium for stronger bones and teeth, phosphorous for tissue formation and iron for healthy blood. Bananas are a very good source of vitamin B6 and a good source of manganese, vitamin C , potassium, biotin and copper. 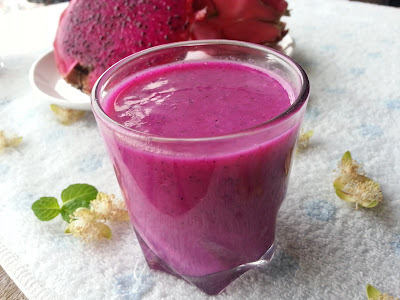 Put all the ingredients in a blender or mixie to blend into a smooth and creamy smoothie . Can add 2 tbsp honey or sugar if you prefer . I have not added as both the fruits used were sweet enough. My smoothie was very thick so I added 1/4 cup milk to it. You can skip this . Really nice i tried it yesterday about dragon fruit and banana combination speechless .